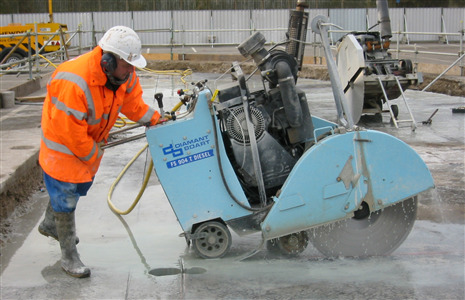 Floor sawing is a quick and efficient method used to cut horizontal flat surfaces such as roads, pavements, runways, car parks, bridges and concrete slabs. Consists of a circular diamond blade mounted on a spindle and powered by diesel, petrol or 3 phase electrical source depending on site restrictions. Typically used for cutting large openings and surface repairs where fast cutting speeds are required.